India’s largest and oldest national park, is known for its tiger project. It is home to more than 40 tigers as well as Indian leopard, sloth bear, stripped hyena, deer, wolf, jungle cat, wild dog. Though it became national park in 1955, hunting has been banned here since 1935. Jungle safari is the main attraction for tourists. The open jeep ride has a high chance of spotting the majestic tigers and other wildlife. Make sure you are planning a trip well in advance as Tadoba is open from October to June only and tends to get booked two-three months in advance. Wildlife resorts and hotels are also easily available. Make your visit suitable to your interest, use Chandrapur trip planner for personalization. Fine Accommodation options like Hotel Mid-town, Starihotels C N Road Bhadravati, Tristar Hotel and Hotel Palace will meet your requirement of where to stay in Chandrapur. Find out how to reach Chandrapur to begin with. Plenty of wholesome Chandrapur vacation packages are available to choose from, pick your today! Love this? Explore the entire list of places to visit in Chandrapur before you plan your trip. Fancy a good night's sleep after a tiring day? Check out where to stay in Chandrapur and book an accommodation of your choice. My experience was awesome. Booked two rides one in the morning and one in evening. I was lucky to see tiger in my first ride only. Ride booking and hotel booking in advance is recommended. Make sure you book hotel near to the ride entry gate. Tip: Book at least two rides so the chances of tiger spotting increases. Had Excellent experience in Tadoba national park , We saw 2 tigers and several animals n followed one tiger for 1 hr when he walked to water reservoir n had bath n swim there. It's really life time mesmerizing experience to see tiger king next to us. Highly recommended......you will definitely see king of jungle there. The place is one of the proudest and the greatest part of Maharashtra. You all will definitely love it. And If you are lucky, you may witness THE TIGER in its own habitat. If you want to experience the wilderness just go to Tadoba and must visit Agarzari Gate. You can surely see the tigers,if not other animals. We saw bear also along with two tigers. The forest here is much dense. The scenic beauty is mind blowing. The most memorable moment of my life. The thrill of starting the Safari early morning at around 5℃ in an open gypsy. 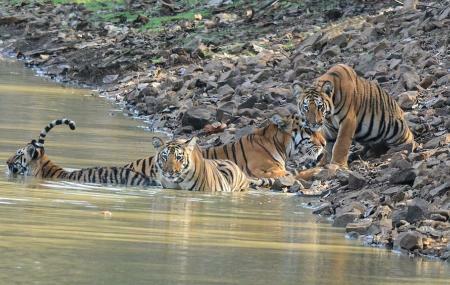 After searching for multiple attempts finally we spotted Maya with her cubs. But the overall experience is must have. One should experience this atleast once in his lifetime.